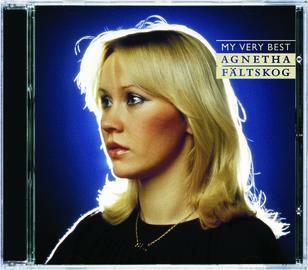 Sony/Bmg have today released a press release for the new CD MY VERY BEST – AGNETHA FALTSKOG. On October 8 released is the career-wide collection album “My Very Best” with Agnetha Fältskog. It is SONY BMG together with Agnetha that have made a collection that reflects her career as a solo artist, from the debut tracks 40 years ago to her last album in 1994 Among the 35 songs are her English-language version of “SOS”, “When you take me in your arms”, “Dream is a dream, and the saga saga”, “Wrap Your Arms Around Me,” “The Heat Is On,” “I Wont Let You Go, “” Let It Shine “and to Agnetha’s special favorite from the ABBA period,” The Winner Takes It All “. . The accompanying booklet contains an introduction by Agnetha, unique images and all song text. Agnetha’s career is remarkable and she is one of Sweden’s most successful artists of all time. ABBA has made all its members world-famous, and a special glow has always been around Agnetha. Agnetha has had a successful solo career as a singer and songwriter. She has also produced many of her own recordings. Agnetha made the list entrance for the first time in January 1968 when the debut single “I was so in love” entered the Swedish Top. . This was followed by five albums and a long list of well-known hits on the Swedish topplistorna. Her solo career continued in the 70s on during her involvement in the ABBA. During the’80s did Agnetha three international solo albums with the help of producer Mike Chapman, Eric Stewart and Peter Cetera. All were big sellers in Sweden and in other countries. In 2004 came the latest album “My coloring Book” which went to Number one directly on the Swedish music charts and sold platinum. 2 Var det med dej? track listing TBC Thanks to Reg. Benny has written a new song, Jag Vill Bli Gammal [I Want to Be Old], for the Swedish comedienne Sissela Kyle who is performing her new show “Dina dagar är räknade” at his Rival Hotel. As expected it hasn’t taken long for certian negative abba fans to start rumours and suggestions about the delay in the opening of the ABBA museum in Stockholm. Facts are the only reason for the delay is due to building works. They have always been upfront and honest about the cost of this venture and Sony juming on board was a godsend for them. But there is nothing in their statement to suggest it is due to mismanagement or funding or the project going bankrupt. Yes I can see that plans had been made to travel to Stockholm for the event, but I plan to still go and have a great holiday in Stockholm as I always do. Perhaps fans should get together and meet up while there so as not to feel it has been a waste of time. Reports of a new Agnetha BEST OF CD have been on the cards for over two months now and finally Ginze.se have listed the CD and the cover. The CD will be released in a standard and digipak version. The CD tracklisting is still to be confirmed. Amazon have it waiting to be listed and say it will retail for around £8.99. The new Agnetha 5 CD Box is now listed on Amazon for £17.99 and HMV have it for £14.99 for pre-order only. To those who have purchased tickets for ABBA the Museum! The renovation of the 100 year old building where ABBA the Museum was meant to open is more extensive and will take much longer than expected. This means that ABBA the Museum will not be able to open in Stockholm on June 4, 2009. This is very sad news for everyone involved, and especially for anyone who has purchased tickets. On June 4, 2009, ABBA the Museum was scheduled to open in Stockholm. But it has become clear that the renovation of the 100-year-old Stora Tullhuset – the location of the museum – will take longer than expected and the project there is more complicated than what was predicted earlier. This means that it’s not possible to open ABBA the Museum in Stockholm in 2009. – It’s better to make this decision at an early stage, even though it’s a sad message. Everyone involved has high expectations, but now we are faced with the facts that we won’t be able to open June 4 on the intended premises. Therefore we have to take appropriate action and review our plans, and open ourselves to new ideas. Because there is no doubt that there will be an ABBA museum, although it may take a while longer than expected, says Ulf Westman, founder of ABBA the Museum. Despite this sad news, the initiators have a bright outlook on the future. The interest in the museum is incredibly large the world over and new investors are entering the project, which will secure its financial future. There is no doubt that there will be an ABBA museum, although it may take a while longer than expected. Those who have purchased tickets may use their right to receive a refund. It may not provide very much consolation, but we will naturally give you a refund for the tickets and the entire opening packages. More information on how this will be done will be sent to you within a few weeks. Ulf Westman, founder of ABBA the Museum. Comments : Comments Off on ABBA the Museum delayed! MAMMA MIA WINS @ NATIONAL MOVIE AWARDS -UK. Meryl & Kylie. The Dancing Queens! It’s not every day an international megastar pays a visit to the New Humanist offices, but that’s what happened yesterday when Swedish musician Björn Ulvaeus, paid a visit to the london Office to say hello along with Christer Sturmark, chairman of the Swedish Humanist Association. Björn’s a high-profile supporter of the Swedish humanists, and he and Christer were in town to meet various humanists and humanist organisations in London, before Björn was in London for the National Movie Awards. From left to right are Christer Sturmark, Björn Ulvaeus, NH editor Caspar Melville and Andrew Copson of the BHA. The latest issue of the totally amazing INTERMEZZO Magazine is now out. Comments : Comments Off on MAMMA MIA WINS @ NATIONAL MOVIE AWARDS -UK.